"The only way to survive a duel with me is to not show up." Profile: Despite all his claims to the contrary, this brawling, swaggering braggart would rather shoot someone in the back than face him in a duel. His courage runs out when his ammunition does. Those who know the true Slugslinger understand that beneath his battle-worn armor-plated exterior lies a cowardly tangle of twitching circuits. To deflect these opinions, he goes out of his way to show off his bravado - as long as he isn't in any danger. He also recalls, with tedious regularity, exploits from his past that illustrate his unsurpassed courage and awesome accomplishments. But these remembrances derive more from his imagination than fact. If the Decepticons didn't find Slugslinger's pomposity so amusing, they probably would have scrapped him a long time ago. Slugslinger's partner is Caliburst, a one-time star actor on the planet Nebulos. Known more for being a ham than being good, Caliburst sought a stage where his theatrical skills would be better appreciated... and rewarded. He found it when he met the Decepticons, who offered him a significant quantity of money to join them. Bio-engineered to be Slugslinger's weapon, Caliburst's cool demeanor strikes fear into most opponents. Little do they know that he is even more scared than they are. But, being the trained actor that he is, he doesn't allow his true feelings to enter into his performance. 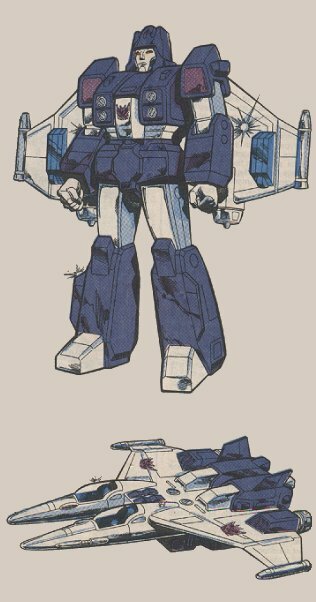 Abilities: Slugslinger transforms into a bi-jet, which has a double cockpit. Either one is capable of controlling the craft. In this mode, he is fitted with two turbo-jets and two solid-fuel afterburners. When the afterburners kick in, he can achieve a maximum speed of 2,400 mph which allows him to achieve sub-orbital altitudes. His range is 3,800 miles. Caliburst transforms into an automatic machine gun, which shoots 1,200 rounds of armor-piercing shells per minute. In either of his modes, Slugslinger can wield weapon-mode Caliburst. Weaknesses: Caliburst often jams while transforming to or from weapon-mode. He gets locked in a position that leaves him useless as a weapon or a person. After flying to his maximum altitude, Slugslinger often re-enters the lower atmosphere too quickly, and begins burning up as a result.